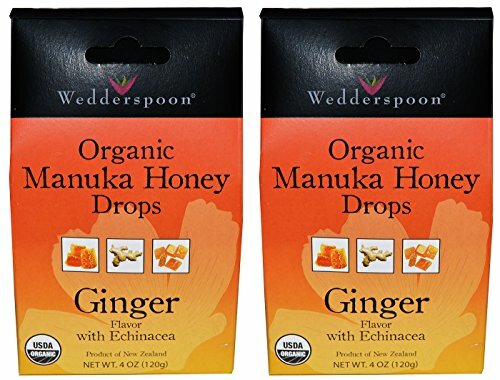 Wedderspoon Organic Manuka Honey Drops (Ginger Pack of 2). 4 Ounce Box With Echinacea. Soy Free, Nut Free, Dairy Free, Egg Free, Gluten Free, Wheat Free, Barley Free, Rye Free, Sulfite Free. USDA Organic Honey Lozenges. No Artificial Coloring, Flavoring or Preservatives. View More In Coughing & Sore Throats. If you have any questions about this product by Wedderspoon, contact us by completing and submitting the form below. If you are looking for a specif part number, please include it with your message.